​ AUSTIN-ROUND ROCK – Source Strategies Inc., a San Antonio-based hotel consulting company, has published the 2016 Hotel Brand Report. 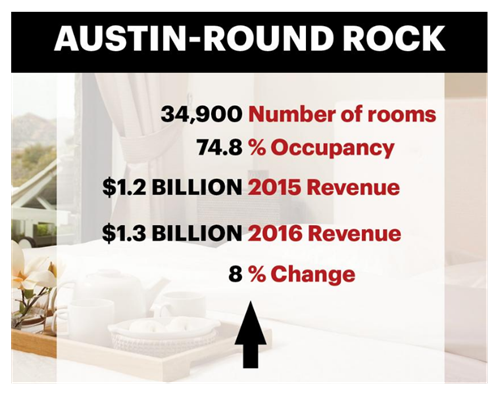 The hotel report shows that the Austin-Round Rock area saw an 8 percent increase in revenue, from $1.2 billion in 2015 to $1.3 billion in 2016. Currently the area has 34,900 hotel rooms, and had an occupancy rate of 74.8 percent.